A light quake with the magnitude of 4.7 struck the area of north of Hawaii Island’s Hamakua Coast at 11:16 p.m. Thursday (March 31) according to the United States Geological Survey. 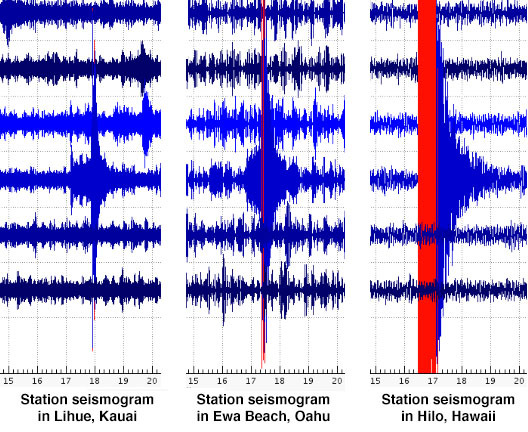 According to the USGS’s ‘Did You Feel It’ website the temblor was widely felt on the island with reports coming in from Volcano, Naalehu, Hilo, the Hamakua Coast, West Hawaii and throughout the state from Maui County, Oahu and Kauai. There is no tsunami expected from this light earthquake. Station seismograms across the state showing the waveform for the 4.7 magnitude quake Thursday night, March 31, 2016. Readout via USGS/HVO.